I've featured this book before on the blog but only showed a few preview pages. Finally having this book in hand, I can see that it's even more detailed than I expected. This is a large 280-page paperback, not like what some websites have listed as 240 pages. The artists featured are all industry experts and you can tell by the quality of work in the book. The sculpts look amazing in terms of detail and design. 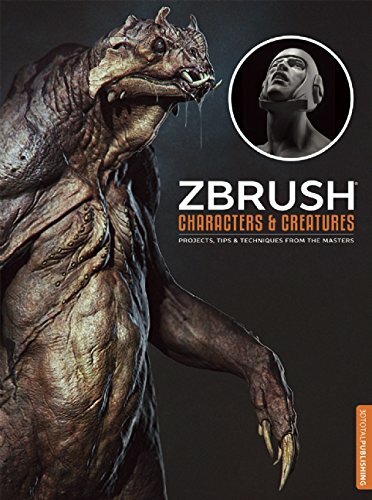 The six main sections in the book are Speed sculpting, Quadrupeds, Creatures, Aliens, Creating fantasy figures and Sculpting a sci-fi character. In each section, there are five to six chapters of tutorials by the guest artists. You'll learn to sculpt a huge variety of subjects. Each tutorial is a step-by-step look at the workflow of the artist from blocking out the general shape all the way to the final stage of adding little details like textures and finally rendering. There are extensive captions for the many screenshots included, explanation for the rational behind each move, tips and techniques for sculpting, such as how you can create subtools. The tutorials are suitable for beginners to experts because the instructions are clear and easy to follow along. For the price of one book, you get several industry-level Zbrush experts with 30 tutorials in all, it's really worth the money.